Trying to keep track of interactions with clients, customers, colleagues, and friends is one of the routine challenges facing business people, and others. When exactly was that last phone call? What did you speak about? Can you track down the e-mail you sent a few months ago? Contacts Journal is a lightweight CRM application from Zaal that aims to help with the task of collecting and tracking phone calls, e-mails, text messages, “to-dos” and favors given and received. Keep in Touch: Tracking calls, text messages, and e-mails is a snap with Contacts Journal, a lightweight CRM application for those who need help tracking communications. Contacts Journal distinguishes itself from similar apps with its inexpensive price tag and simplicity of operation. 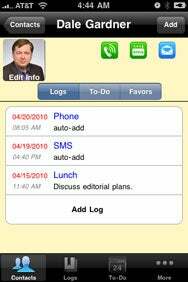 A free version of the app, Contacts Journal Lite, allows you to try things out with support for a limited number of log entries. When starting the app for the first time, you’re prompted to import existing contacts from your iPhone’s Contacts. The application allows you to import all of your contacts, or to select specific individuals. The process is rapid, with the application processing several hundred records in less than a minute. Once the initial import is completed, future modifications to contacts in either the built-in Contacts application or Contacts Journal are automatically synchronized. However, new records must be imported by hand—a task which would be better automated. Selecting an individual contact displays a screen showing a log of past interactions (e-mails, text messages and phone calls). You can readily select individual records to review or edit, or start a new call or message. For each operation, Contacts Journal presents phone numbers or e-mail addresses associated with the individual. Select the desired entry, and the application will transfer you to the appropriate built-in app on your iPhone. At the same time, Contacts Journal will record a new log entry, capturing the date, time, and type of communication. You can enter notes for each record, and there’s also a location field (though Contacts Journal doesn’t interact with the iPhone’s location services, so entries must be added manually). The same contact display also provides a location to enter or review to-do records and favors given or received. A Logs view provides a list, sorted by date, of interactions with all of your contacts. You can select and edit individual records as well as add new entries. Pressing Add retrieves a list of contacts—simply select the desired individual and proceed with the desired form of call or message. A to-do tab provides similar functionality for tasks associated with individuals. Contacts Journal supports the ability to e-mail logs associated with an individual, and the entire database can be backed up and restored via a built-in Web server. While integration with the built-in Contacts application is solid, Contacts Journal suffers from an inability to integrate with the built-in iPhone calendar, and the absence of alarms or reminders for time-sensitive tasks. The developer indicates there are plans to add these capabilities in a future, iPhone v4.0-based, release. (On the Contacts Journal App Store page, Zaal also mentions plans to remove the Favors tab in a future update, though, quite frankly, I found that particular section to be the least useful piece of the app.) Until that future update arrives, Contacts Journal still proves useful for anyone who needs help in keeping track of their communications and commitments.